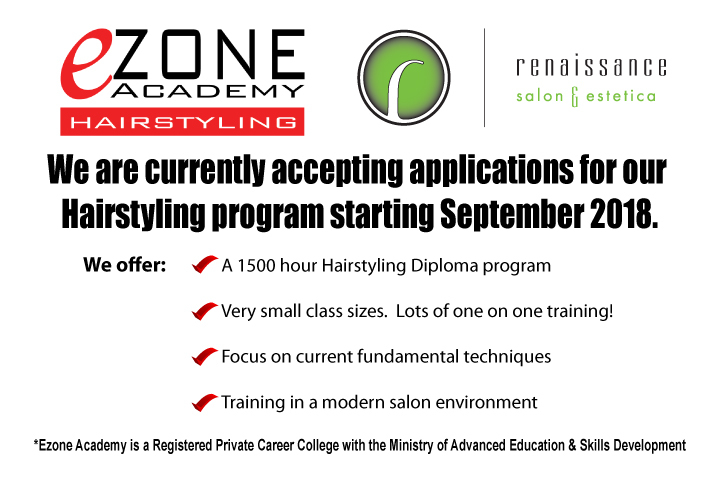 Ezone Academy offers a 1500 hour Hairstyling diploma program. Our school focuses on the fundamentals of Hairstyling with emphasis on current cutting & colouring techniques. Our instructors are experts in the industry with many hours of training from courses all over North America and overseas. We provide students with the knowledge they need to prepare for their certification exam and have a successful career in this field. This is a 54 week program. We help the students build a strong clientele, through client workshops and self promotion. After the first 6 months, students begin work on clients under close supervision by licensed stylists/colorists. We provide promotional materials such as student price lists and business cards to help students recruit clients. We have an extensive organization/goal setting program designed to create strong work habits for the future. We provide a diploma upon completion of the program. CALL TODAY FOR MORE INFORMATION OR ARRANGE A FREE TOUR!